As of 2017, student debt hit its all time high of 1.4 trillion dollars. And that number may grow year over year, which is why it’s important to understand how graduates manage their debts. What would they do differently with their education or loans if given a chance? Do they regret seeking a college degree? And how does school debt affect borrowers? We asked over 1,000 Americans these questions and more. Here’s what we learned. Which college majors leave students with the largest debts? 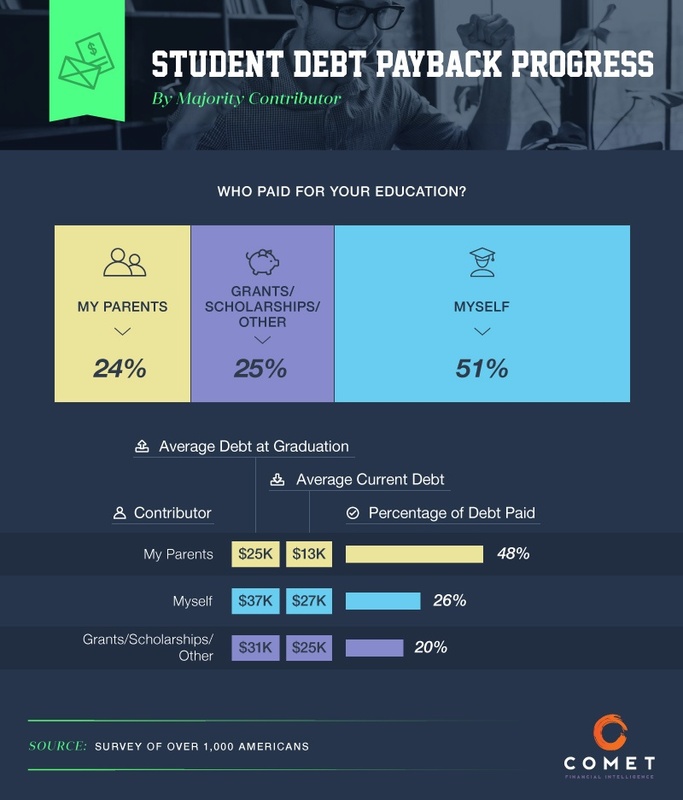 Who’s paying their debt off quickly, and who’s falling behind? According to our survey, those who made the most progress on their debt are currently working in broadcasting and journalism. In part, this may be because their debt was smaller to begin with – at just $27,000 compared to $43,000 in the medical and health care field, or $39,000 for a science-related degree. It also may be because people who pursue a career in journalism have a curious personality and are willing to experiment, set goals, pursue stories, and even make themselves purposefully uncomfortable to achieve those goals. Other groups that substantially paid down their debts included those who work in publishing, construction, and real estate, while those with the least progress included the unemployed, as well as those in telecommunications, scientific fields, and medical and health care. 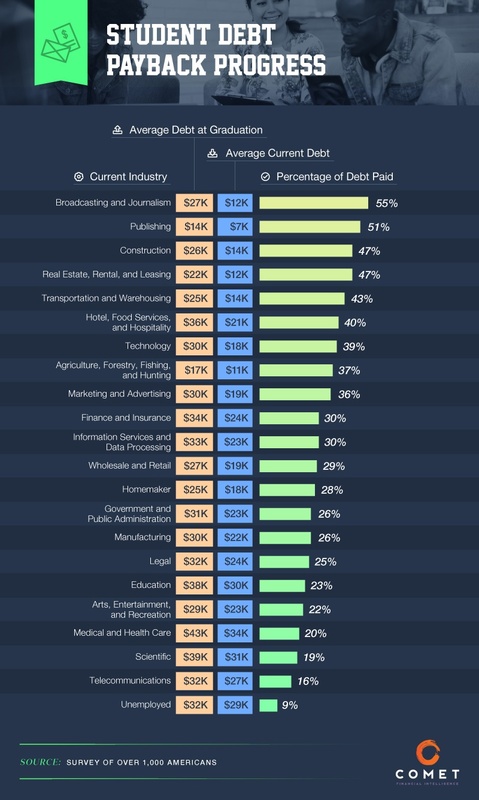 The latter two fields are particularly surprising since they’re known for high salaries and good job opportunities. So why is it that journalists have paid off almost twice as much debt ($15,000 compared to $8,000 and $9,000, respectively)? Perhaps it’s because medical professionals were more likely to have other types of debt – business loans to buy into a practice or personal debt incurred during residencies they were simultaneously paying off. Perhaps it’s because people who choose these professions value lifestyles that require more spending, or it may be that medical degrees aren’t quite the financial windfall we think they are. Who’s Paying Off School Debt? So we know certain majors are more likely to pay off debt faster, but who is paying off those student loans? It turns out the people who paid off larger percentages of their student loans relied on parental assistance. Although 51 percent of students paid back their loans on their own, those with grants or scholarships were the least likely to pay off debt at a quicker rate. Public vs. Private Education: Which Debt Lasts Longer? When it comes to paying off debt, does where you go to school matter? According to our survey, the answer is yes. Private college graduates had the largest debt burden, yet they made the most progress paying off their debt. Perhaps this is because those who can afford a private education were also more likely to have money and connections. For some graduates, it may be true that private education leads to higher-paying jobs (though many experts are skeptical, one study did show a wage gap between graduates of public and private universities). If you could do college all over again, would you do it differently? Regarding the cost of postsecondary education, participants said yes. Forty-nine percent of graduates wished they had lived with their parents and attended community college for two years before moving on to a university – a strategy more and more young people seem to be adopting these days. Conversely, 33 percent said they wouldn’t take this opportunity, while 18 percent did exactly that. 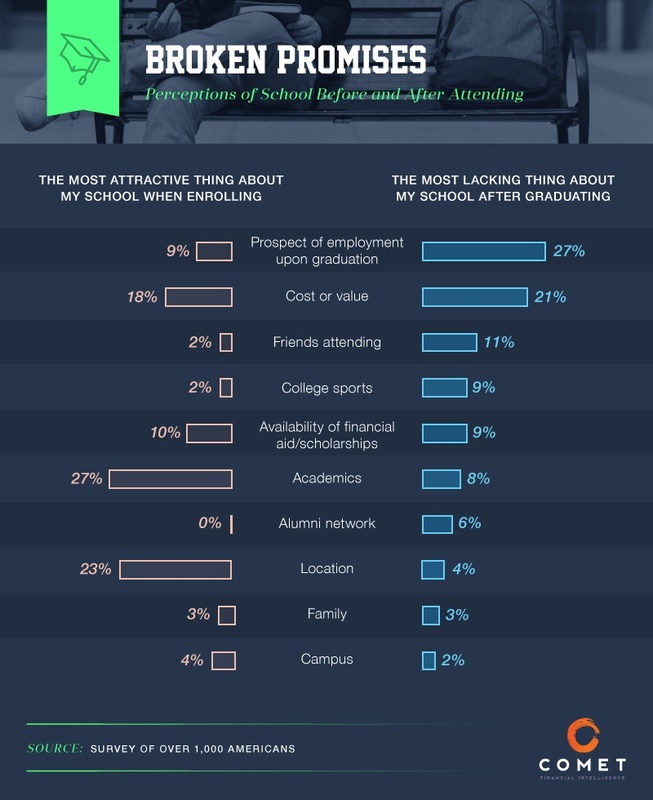 Moreover, 46 percent of respondents thought their education was not worth the cost, while 50 percent of people would have chosen to attend a less expensive university if they could do it again. Of the 47 percent of respondents who would choose a different school, 20 percent said it was because their school was overpriced and 13 percent would have liked to save more money. For 19 percent of respondents, being able to choose a different career was the real appeal of other schooling options, and for another 17 percent, it was a chance for self-reinvention that they felt they missed out on. Another 9 percent felt pressured by their parents to attend the school they did, and still another 9 percent felt the quality of their education was not good enough. With over 44 million Americans burdened by student debt and the average being $37,000 due per person, a lot of people would love to get that weight off their shoulders. However, how much does debt really affect college graduates on a day-to-day basis? The answer, unfortunately, is a lot. When we asked participants if they had the cash to cover a $400 emergency, 46 percent said they didn’t. The group that could afford to do so was the one with no student debt. 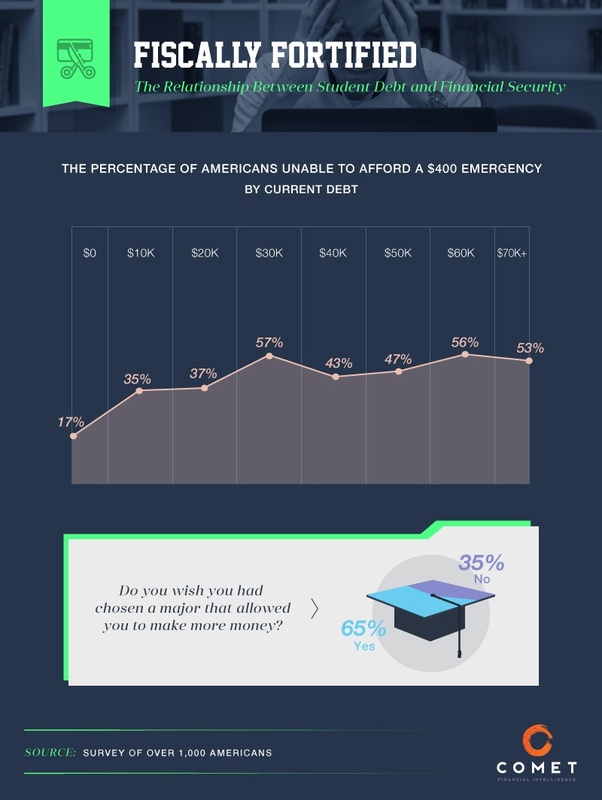 Only 17 percent of those with no debt couldn’t handle a $400 emergency, compared to 57 percent of those who owed around $30,000. Further, 65 percent of respondents said they wished they’d chosen a major that led to higher-paying job opportunities. Are Schools Living Up to Our Expectations? When it came to choosing a college, most participants said academics, location, and the cost or value were the most important factors. Unfortunately, while two of these – academics and location – were up to standard, 21 percent said their schools fell short regarding cost and value. While most respondents didn’t choose a school specifically to get a job, 27 percent believed their schools fell short concerning future employment prospects – a finding that tallies with recent data reporting 25 percent of recent college graduates are overqualified in their field and are failing to maximize their earning potential. If you’re like most college graduates, you probably know what it’s like to have student debt. If you’re like most of our survey respondents, college debt has directly affected your life and financial security, and your university probably fell short on some of its lofty promises. The good news is that you have an education – something most participants found more valuable than being debt-free. Don’t forget, debt doesn’t have to last forever. CometFi can help you pay it off quicker and cheaper – starting now! We conducted a survey of over 1,000 Americans to discover their attitudes toward student loan debt, and their progress paying it back. Results were compiled from those who had, at a minimum, received a degree from a technical or trade school. Over 97 percent of respondents reported they completed a degree from a four-year university, at the least. When necessary, majors were categorized according to the NSSE major categories. You can borrow as much as you like (for noncommercial purposes) when it comes to the content on this page. All we ask is that you link back here, so proper credit is given to the study’s authors.